Histogram (Histographs) are similar to bar charts apart from the consideration of areas. It is used when the frequency distribution of grouped data is given. Here class limits of the data should be real. In a bar chart, all of the bars are the same width and the only thing that matters is the height of the bar. In a histograph the area is the important thing. In histograph, there should be continuous frequency distribution data. If the data is not continuous then first convert the given data in continuous form by adding 0.5 to upper class limit and subtract 0.5 from the lower class limit. Here we have represented the groups of observations (i.e., class intervals). We draw two perpendicular axes and choose a suitable scale for each axes. We mark class intervals on the horizontal axis and the respective class frequencies on the vertical axis. 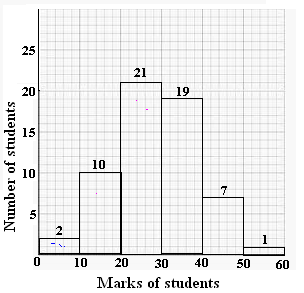 The height of the bars show the number of data items in a particular group and is the frequency of the class-interval. Also, there is no gap between the bars. Sometimes, jagged line or broken line has been used along the horizontal line to indicate that we can not show all the numbers after zero to the 1st class of the given data. The graphical representation of data in this manner is called a histograph. the group 20 - 30 has the maximum number of students. The group 50 - 60 has the minimum number of students. The group 30 - 40 contains 19 number of students. The number of students who got marks between 40 to 50 are 7.